Zotac has proved that you don't have to buy a hulking tower PC just to get into VR. The Macau-based computer maker has squeezed a desktop-class Nvidia GTX 980 graphics card into a small form factor PC that exceeds Nvidia's minimum requirements for virtual reality gaming. Called the Magnus EN980, the muscular mini PC pairs a 980 with an unspecified sixth-generation Intel Skylake processor. Zotac has worked its water-cooling wizardly into the EN980, which combines liquid channels, heatpipes and heatfins to prevent overheating. It apparently operates at a whisper too, which is a bonus if you plan to use it as a living room media hub along with the HTC Vive. Around the back of the EN980's "minimalistic" case are HDMI and DisplayPort connections, which together supports up to four external displays, in addition to USB Type-A and USB-Type C ports. 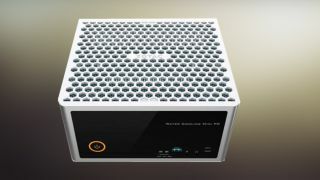 Of course, it also bolts a dual Gigabit LAN port to its rear and houses 802.11ac WiFi for untethered internet access. Zotac is placing the Magnus EN980 on display for all and sundry to ogle at this year's GDC and CeBIT expos. There's no word yet on pricing or availability. It comes as little surprise to find that Nvidia's high-end GPU has wormed its way into a mini desktop PC following its recent move into high-end gaming laptops such as the PC Specialist Octane II.